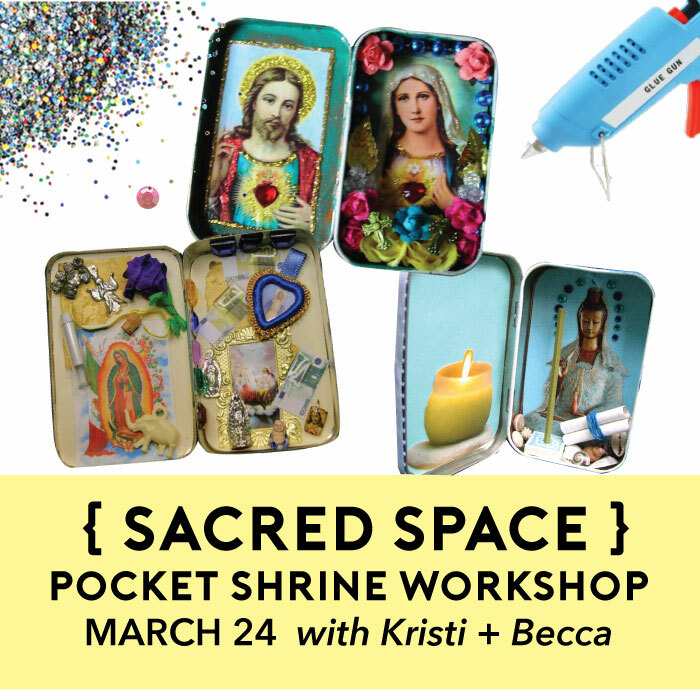 Since grottoes and shrines have so much in common I wanted to share the results of a recent workshop hosted by Kristi Norman and me at the Abundant Wellness Center in Dubuque- we made tiny personal shrines in altoid tins. Stealing a phrase from the Unarius Academy I like to refer to these as "cosmic brain batteries"- not necessarily a place of deity worship but a small symbolic space of beloved objects, affirmations, fantasy, memories, dreams, an escape- whatever you want to charge yourself in whatever way you desire. I brought over my craft supply stash and some prints of deities, mandalas, etc. Dried moss and vintage fringe/trim were huge hits- and attendees brought some of their own items such as crystals, pebbles, and vials of essential oil. Kristi made small votive candles out of bottle caps. It was really inspiring to see how quickly everyone dove into the project and began experimenting with materials- and of course, every shrine reflected it's makers personality. Thanks Kristi for the great event idea and everyone who attended!